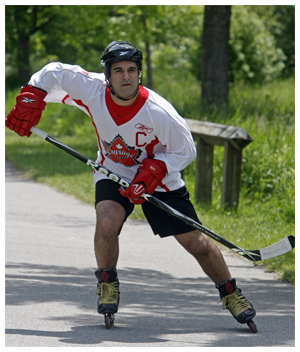 In May 2009, DeMontis launched Courage Canada by skating from his hometown of Toronto, Ontario to the Home of the 2010 Winter Olympic/Paralympics Games in Vancouver, British Columbia. With full safety gear, hockey stick in hand and rollerblades strapped he will skate on a five to six month journey across five province to raise money for the organization he has founded, called Courage Canada to give thousands of blind youth across Canada the chance to learn to play the national game of hockey. His objective is to raise national awareness and support for the needs of these young people to participate in international events like the Olympic Games. Courage Canada will raise money to start learning to Skate Programs Skill; Development Camps; and a Canadian Blind Hockey Players Association. After losing his sight at age 17 as a result of a rare diagnosis, the University of Western Ontario student is now determined to prove to the nation and the rest of the world that even though he is blind, he can still skate. DeMontis will skate to the Winter Games to start the dream of one day witnessing the sport of Blind Hockey in the Paralympic Games. “No matter if a Canadian youngster is with or without sight, he or she should be given the chance to play the game of hockey. Every child should be able to dream of one day wearing the red and white for Team Canada”, said DeMontis. “Even though I am blind, I have not lost my vision of having a group of blind Canadian youngsters competing in the Paralympics Games”, he added. If Mark can achieve this, what can’t you achieve?